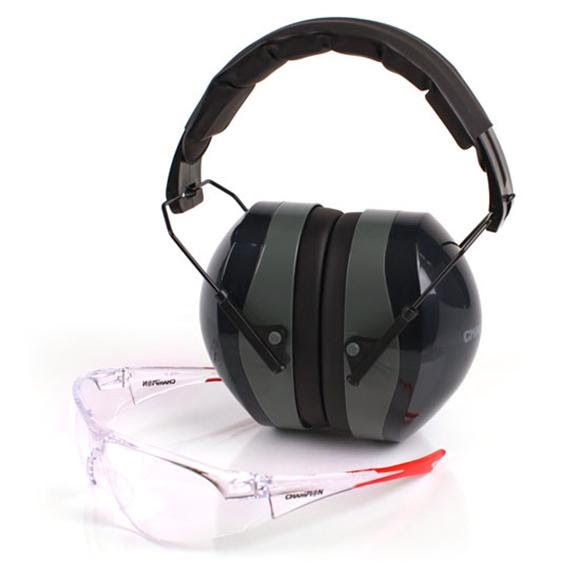 Protect your eyes and ears on the shooting range with Champion®'s Ballistic Eyes And Ears Combo. These safe, stylish and practical combos contain our 26NRR passive muffs, coupled with shooting glasses that feature ballistic rated lenses providing four times greater impact protection than ANSI Z87.1; meeting military standard MIL-PRF-31013, 3.5.1.1 ballistic resistance. Protect your eyes and ears on the shooting range with Champion®&apos;s Ballistic Eyes And Ears Combo. These safe, stylish and practical combos contain our 26NRR passive muffs, coupled with shooting glasses that feature ballistic rated lenses providing four times greater impact protection than ANSI Z87.1; meeting military standard MIL-PRF-31013, 3.5.1.1 ballistic resistance.